I happened to be the third man in the ring this weekend as New York's local prospect, Gabriel "Tito" Bracero, notched his 17th straight victory, without a loss, and it happened to be one of the very rare times that I oversaw a clean knockout. What came to mind immediately after a vicious one punch knockout, in which his opponent lay motionless for nearly 20 seconds, was when is it the right time to stop a fight? A referee has a responsibility to the boxers and the commission to maintain safety, as much as he/she can, while also giving each boxer the opportunity to come back, even when it seems their situation is dire. There is a very fine line in knowing when to stop a fight, as you will hear many referees state that they would rather stop a match one punch too soon, rather than one punch too late. While this philosophy seems logical, it doesn't apply in every situation. I think it certainly helps in understanding the boxers that are in the ring. If possible, the more information you can gather about a boxers' tendencies will help you make a more informed decision when/if the time comes in which you have reached the one punch too soon, or one punch too late moment. In 1996, New York's Wayne Kelly was the referee for a young prospect named Arturo "Thunder" Gatti at the Theater in Madison Square Garden, where Gatti first showed the boxing world his tremendous courage and amazing recuperative powers. After being knocked down and severely hurt in the match with Wilson Rodriguez, and on the point of having the match stopped, Gatti came back and won the bout by knockout. 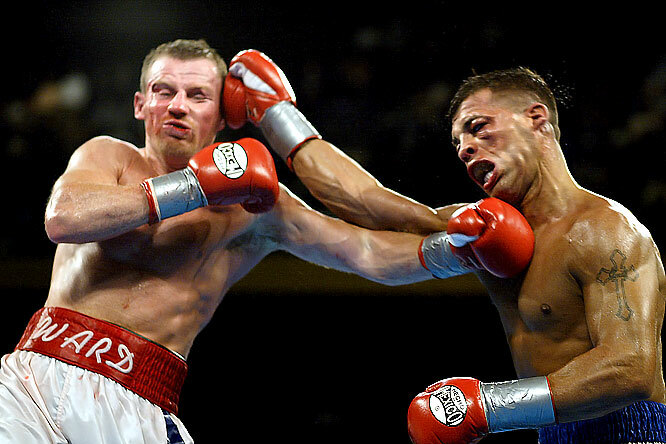 By 2002, the boxing community had become accustomed to Gatti's heroics and referees understood that Gatti, if hurt, would probably recieve the benefit of the doubt. Gatti fought his first match against Micky Ward in Connecticut that year and Round 9 will go down as one of the best in boxing history. An ingredient that helped make this round sensational was referee Frank Cappuccino allowing what appeared to be a totally defenseless Gatti, at one point, the opportunity to come back. Gatti's cornerman was on the apron, with a towel, seconds away from halting the contest, as HBO commentators are nearly screaming for the fight to be stopped. While I don't believe that Cappuccino would have allowed too many matches to continue if the situation was equal, he did allow Gatti to continue, and remarkably, Micky Ward punched himself out and Gatti closed out the round landing combinations that still seem humanly impossible. I have had people ask how do you know when to stop a fight, and there really is no definitive answer. Each scenario is different and you have to be clear headed, and in the moment, in order to make the best decision at the time. One moment is different than the next, and while knowing the boxers traits certainly helps, many times, you do not know the boxers and have to make decisions that will effect their careers and lives for years to come. The clear difference in officiating amateur matches and professional bouts is how much punishment a boxer is allowed to absorb. A clear shot in an amateur match will more times than not warrant an eight count, whether the boxer is hurt or not. In the pro ranks, that same shot means little to the official other than a scoring blow. As I reflect on "Tito" Braceros' vicious knockout of Daniel Van Staden (8-7, w 4ko's) and the two previous knockdowns in the match this weekend, I wonder if the underdog should have been given the benefit of the doubt, as I decided to give him after the second knockdown. The reason many times a boxer is allowed to continue when it appears that he/she may be overmatched is the boxers themselves. The boxer, by his body language and determination will relay a message to the referee that he is fit to continue. It is up to the referee to be able to read body language and take into account what led up to the knockdown. While there was little question that Bracero dominated the action prior to the knockout, Van Staden continued to rise and fight back gallantly, albeit, in a losing effort. However, we have witnessed many times a young, undefeated prospect lose to the boxer with the .500 record after being knocked down. Boxers are oftentimes the ones responsible for the match being stopped, moreso than the referee, based on what he/she relays to the referee. Many times, a boxer will get cut and tell the referee immediately that they cannot see. At that moment, the referee has little choice other than to stop the match. Contrary to that reaction, I have seen boxers escorted to the ringside physician after a cut and plead to have the match continue. There have been some very deep, grotesque, cuts, that probably should have had the match stopped, but the boxer pled his case and was allowed to continue. Gatti was known to fight back with a vengeance when hurt, cut, or eyes nearly swollen shut. My point, by and large is that while the referee has a lot of responsibility to the boxers and the Commission, with respect to safety, the boxers themselves also play a vital role in the call that the referee makes. Several weeks ago,veteran boxer DeMarcus "Chop-Chop" Corley was facing young prospect Thomas Dulorme. Dulorme had dropped Corley in the second round with a right hand and while I was giving Corley the standard eight count, he was talking to me, letting me know that "it was a good shot". At that point, when I reached the eight, I didn't bother to ask Corley if he was ok, because he had already revealed to me that he was fine. I wiped off the gloves and the action resumed (Corley lost a decision). There are a lot of factors that go into making the "right" call, but being in the moment is what ultimately helps with the final verdict. Gaining information prior to the match helps, knowing a boxers tendencies helps, reading the boxers body language plays a part, but it's a combination of all of this that must be taken into consideration when you are attempting to make a decision that will ultimately be, the final decision. Being in the moment has a lot to do with mental preparation, as much as physical readiness. The action takes place so quickly that with all the factors previously mentioned, you have very little time to make an informed decision. What you don't want is to go into the ring with anything other than the match at hand on your mind. It is difficult enough to make decisions quickly, to have your mind preoccupied could be disastrous. We literally have lives in your hand, so we need to prepare as best we can so that we will be an asset to the profession. Harvey Dock was inducted into the New Jersey Boxing Hall of Fame (Class of '94) for his accomplishments as an amateur boxer, and has been a professional referee since 2003. He currently trains a stable of amateur boxers. His column here at ringsideboxingshow.com addresses The Sweet Science from the perspective of the third man in the ring.